Chicago is a city unlike any other. Known as the Windy City (for our politics, not the weather), Chicago is home to over 100 neighborhoods, each unique in its own way. This Chicago city guide will help you make sure you see as much as possible on your visit! Even the flag has it’s own meaning: the stars represent the four major events in Chicago’s history, the blue stripes represent the iconic Chicago River and the Great Canal, and the white stripes represent Chicago’s North, West, and South sides. Some wonder why the city doesn’t have an East side… thats because it is bordered by Lake Michigan on the East, and therefore the lake is considered to be the East side of the city. The city’s streets, howeverm are divided into east and west sides at State Street, which is home to the Chicago Theatre and the original Marshall Field’s (which has since been converted into Macy’s). Chicago is home to the second tallest building in the USA: the Willis Sears Tower. Known for decades as the Sears Tower, it was recently renamed as the Willis Tower. The reason for the name change? Willis is the company that owns the largest amount of space inside the building. Don’t get caught by a Chicagoan calling it Willis though, we recommend sticking to Sears. Inside the tower is the Skydeck, a glass-bottom balcony that lets you stand over the city and see straight down. An other must see in the Chicago skyline is the John Hancock Building. Once one of the tallest buildings in the world, the Hancock features the city’s newest observatory: TILT. The best view, however, is from the Signature Lounge bar on the Hancock’s 96th floor. Unique architecture is just one of the mesmerizing things about Marina City. These two twin buildings are also iconic due to their appearance in the Blues Brothers film and can be seen in The Dark Knight. Chicago’s Navy Pier is a tourist attraction loved even by the city’s locals. It is home to a Children’s museum, fireworks show (during the summer and major holidays), a ferris wheel, and an enormous food court. The Ferris Wheel at Navy Pier is modeled after the original, which was built in Chicago for the 1893 World’s Fair. In Fall 2015 the Ferris Wheel was removed and will be replaced by an even larger one. For an awesome view of the city, I recommend taking a trip to the museum campus. Just a ten minute drive from Millennium Park, this strip of land is extended out into Lake Michigan. While there is not much else to do here other than go to a museum, on a clear day/night the view of Chicago’s skyline is spectacular. If you are in town for a few days, I recommend taking a guided tour. Chicago has many options including a river based architecture tour, double-decker bus or trolley neighborhood tours, or a free tour by foot. Whichever you decide to do, make sure to bring your camera, because Chicago is a city unlike any other. Mixed in with the skyscrapers and El tracked, are the hidden gems of Chicago: the parks. The largest park in the city is Grant Park. It’s large size makes it the perfect host for some of Chicago’s famous festivals, Lollapalooza and the Taste of Chicago. In Grant Park you will find Chicago’s iconic Buckingham Fountain, considered to be Chicago’s front door when welcoming visitors. Nestled next to Grant Park and built over parking garages and train tracks is Millennium Park. Millennium Park is home to one of Chicago’s biggest tourist attractions: The Cloud Gate Structure AKA The Bean. A short walk across a highway is the brand new Maggie Daley Park, a must see in the winter with its one-of-a-kind ice rink. It is also home to an unforgettable playground, perfect for kids of all ages. A new addition to Chicago’s park scene is The 606. The former elevated train line was converted into a park in 2015. The 606 is 2.7 miles long and features a graffiti gallery, observatory, and running/walking path. Fun Fact: If you are a Wizard of Oz fanatic, Lincoln Park is home to Oz Park. There visitors can take pictures with statues of Dorothy, the Tinman, the Lion, and the Scarecrow. Lincoln Park Zoo is just a few blocks away and is one of the nation’s last free zoos. A quick visit to the zoo doesn’t have to include just lions and tigers and bears…. it can also include a walk along Lincoln Park’s Nature Boardwalk, pictured below. If you are up for a trip out of the city, the Northern suburb of Highland Park is home to Chicago’s Botanic Gardens. The Gardens are home to many different botanical landscapes, including a Japanese Garden! Chicago is known for its extraordinary museums. There are many spread out through the city, both small and large. The larger museums include the Adler Planetarium, the Art Institute of Chicago, Chicago History Museum, Illinois Holocaust Museum (located in the suburb of Skokie), Morton Arboretum, Museum of Contemporary Art, Museum of Science and Industry, and The Field Museum. A visit to the field museum will include meeting Sue, the largest, most intact T-Rex fossil. There are many smaller, cultural museums as well including the Balzekas Museum of Lithuanian Culture, DuSable Museum of African-American History, Hellenic Museum and Cultural Center, Latvian Folk Art Museum, Mitchell Museum of the American Indian, National Museum of Mexican Art, Oriental Institute Museum, Polish Museum of America, Spertus Institute of Jewish Studies, Swedish American Museum Center, and the Ukrainian National Museum. If you are in town for a while check out the museums’ websites… there may be a free museum day going on! The Art Institute is free for children under 14 every day. For the kiddos, there is also the Chicago Children’s Museum at Navy Pier, where children under 15 are free the first Sunday of every month and Thursday evenings from 5-8pm. There is also the Kohl’s Children’s Museum in suburban Glenview, which offers discounted admission to members. Each museum has exhibits for designated for children. 3 words: CHICAGO STYLE EVERYTHING. Chicago Style pizza with it’s deep dish crust and layers upon layers of gooey cheese… try this at one of many places: Lou Malnati’s, Giordano’s, Gino’s East, or Pizzeria Uno/Due. WARNING: Be prepared to wait at least 45 minutes. 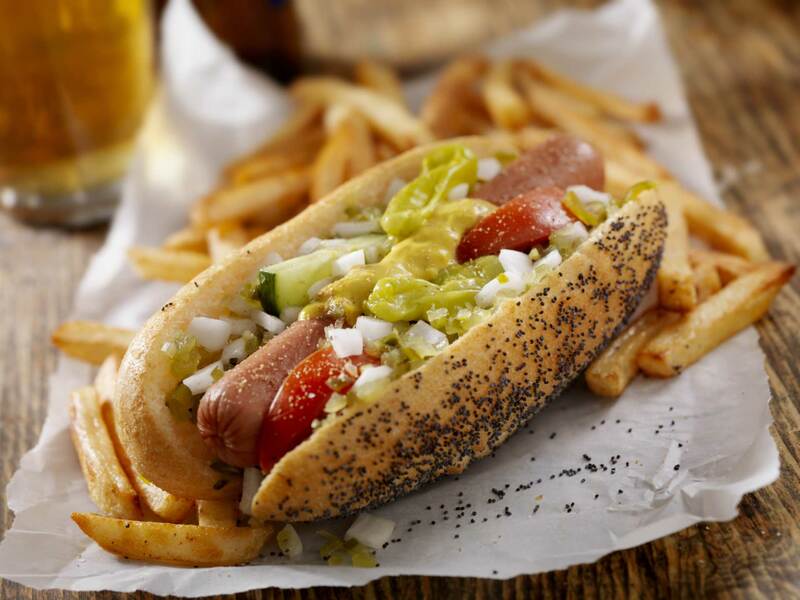 Chicago Style hot dogs are topped with everything you could imagine, but don’t even think about putting ketchup on one… there are many places you could go for these. I recommend Belly Shack, Chicago Dog House, Fatso’s Last Stand, Hot “G” Dog, or Original Jimmy’s Red Hots. 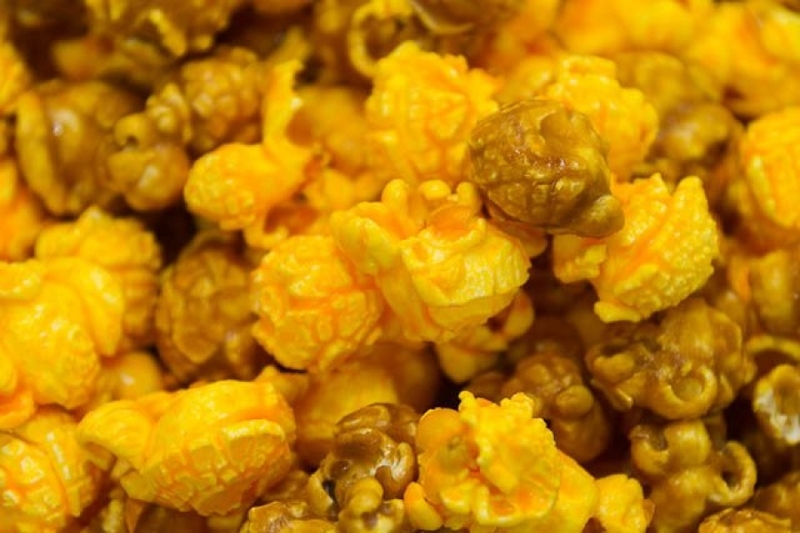 Chicago Style popcorn, a perfect mix of cheddar and caramel… Garrett’s or Nuts on Clark are the two most popular places in the city. Try them all, more than once! Chicago also has some amazing restaurants. Lincoln Park has some of the coolest places, along with the Fulton Market District. But regardless where in the city you are, there are sure to be hundreds of options to choose from! For inspiration on where to grab lunch/dinner, I always recommend checking out a few food instagram accounts. List of my favorites can be found on one of my previous posts! In the 1920’s Chicago was the home of speakeasies and jazz clubs. Since then it has become the home of comedy. Comedy clubs like The World Famous Laugh Factor, Zanies Comedy Club, and The Second City are known to produce the world’s most prominent comedians (the likes of Stephen Colbert, Tina Fey, Jane Lynch, for example). Chicago also has a very hip bar scene. Clark Street in Wrigleyville is where you are most likely to find post-grads and Cubs fans looking for a good time and a place to watch the Cubbies play. Lincoln Park houses some chill bars and fun dance floors. River North and the Gold Coast is more of a nightclub scene. Popular clubs rotate through, but be sure to check out this area if this is your scene. Studio Paris, Underground, and American Junkie, just to name a few. For an awesome time with a marvelous view of the city, Vertigo Sky Lounge is the spot, with it’s enclosed rooftop lounge area. Whether you are trying to get into/out of the city or just make your way around it, Chicago has many options to offer. Chicago is home to two major airports: O’Hare (the big one) and Midway (the smaller one). O’Hare is about a 40 minute drive out of the city and is easily accessible by the CTA Blue Line. Whereas Midway is about a 25 minutes drive out of the city, and is easily accessible by the CTA Orange Line. Unlike NYC’s underground subway system, the CTA El trains (El stands for elevated, not electric) wind between buildings and are integrated into the city’s skyline. Chicago has great taxi services, along with an enormous Uber and Lyft presence. For a more active commute, visitors and locals alike elect to use Divvy bikes (similar to NYC’s Citi bikes). Divvy stations are located around every neighborhood in the city and the service cost is just $9.95 for a 24-hour pass, with annual options available as well.